The first thing Jane Bussmann told the crowd, after being welcomed by a troupe of drummers led by a skinny Senegalese man with fat dreadlocks, was that what we were about to hear was a heavily truncated version of her book Worst Date Ever (Or How it Took a Comedy Writer to Expose Africa’s Secret War). Since the show was never extensively marketed in Ugandan media, it figures that most of the audience turned up because of social media word-of-mouth, all eager to hear the story from its protagonist. 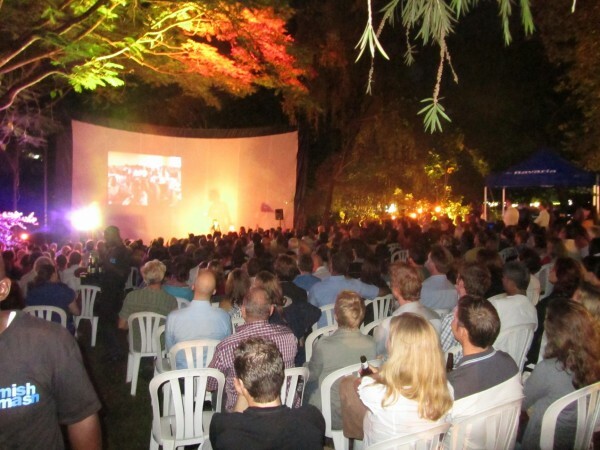 Bussmann’s reputation as a comedy writer, with popular programs like South Park and Smack the Pony on her CV, probably also had a hand in drawing the 600-strong crowd to MishMash, Kampala. The show was not like the usual comedy nites or mic checks in Kampala. Bussmann was basically trying to bring the story of Worst Date Ever to life using audio and visual aids, sometimes relying on the events being recognised by members of the audience who have read the book. 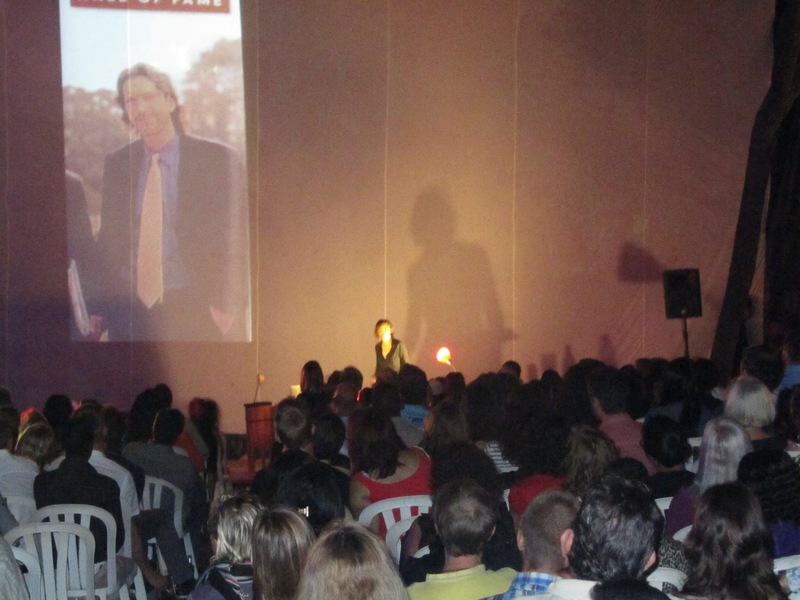 Jane Bussmann performing her show at MishMash, Kampala. Jane started off by detailing the angst her career as a celebrity journalist had filled her with back in 2003. How, during an interview with Ashton Kutcher—the then hottest man in America!—she was preoccupied with thoughts of suicide. By turns, her story was pathetic, funny and heartbreaking. At one point, Bussmann described how she raced frantically around Gulu town in search of lip volumizing lip balm, so she could look hot when interviewing John Prendergast, the man of her dreams. Jane Bussmann searching for John Prendergast. Next, she told how Colonel Otema ordered for the body of a freshly buried young man to be exhumed for her viewing pleasure, and how he excitedly explained that the man, a boy really, was shot for being a LRA rebel. Delivered in any other style; this tale would be a heartbreaking tragedy. Using humor, Bussmann turned it into a rib breaking one as well. The somberness of the audience after hearing this story was lightened by the alcohol that they had consumed in copious amounts. And maybe also by the fact that Jane showed us how hilarious the human experience can be, even in the grimmest of conditions. How willing are people to substitute tears with laughter? Consider the recent assault of Ingrid Turinawe, an incident which has exposed our police as a force that will take all chances to cop a feel of everything we consider valuable and private, from the insides of our wallets to our bodies. The assault has been widely reported, decried and debated. It has also been heavily satirized and parodied by humor columns and websites like urbanlegendkampala.com. Reactions to these humor sketches have been mixed; with more people rejecting the satire and expressing more disgust than amusement at these sketches. The arrest of Ingrid Turinawe, May 2012. 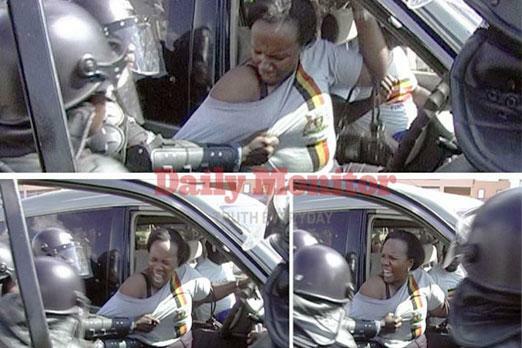 Image collage by Daily Monitor. Lying about the lives of entertainers to avoid being blacklisted by their agents slowly tips her into an existential crisis, one whose curtains are parted when she discovers the existence of John Prendergast, a very attractive peacemaker. What follows is an account of her flying to Uganda on cupid’s back to get an interview out of him, and maybe more if she can manage it. Her plan fails immediately. He leaves the country on another of his world saving missions before she has a chance to even meet with him. Jane finds herself in Gulu with no friends and no allies, keeping the company of colonels like Otema, peacemakers like Betty Bigombe, and traumatized former child soldiers. How dare you tell our story!? Not all Ugandans have enjoyed this book and many have expressed annoyance at this Caucasian woman’s audacity. Some have asked how Bussmann can dare to write with such irreverence about the LRA war, which lasted over 20 years and planted trauma deep into the psyches of all Ugandans, especially Acholi people. It is unclear whether their annoyance stems from the fact that a Caucasian person is being lauded for writing about such a Ugandan story, or whether it is because of how she has used a humorous style in the writing about such a sensitive issue. When put on the spot about this, many people stutter and fumble with their words. We all witnessed Invisible Children throwing themselves off a cliff with the uploading of the Kony 2012 video. People were disgusted at its inaccuracy, its shallowness, and the way it reduced a 20-year-war to a 30-minute MTVesque video. “Uganda’s story is an incredible story, and the reception of this video shows how immense it is and how interested the world can be. Instead of all the fey trivia in columns throughout the world, all these human angle stories should be written. Instead of rowing about the video, I think people should write and present their own stories. 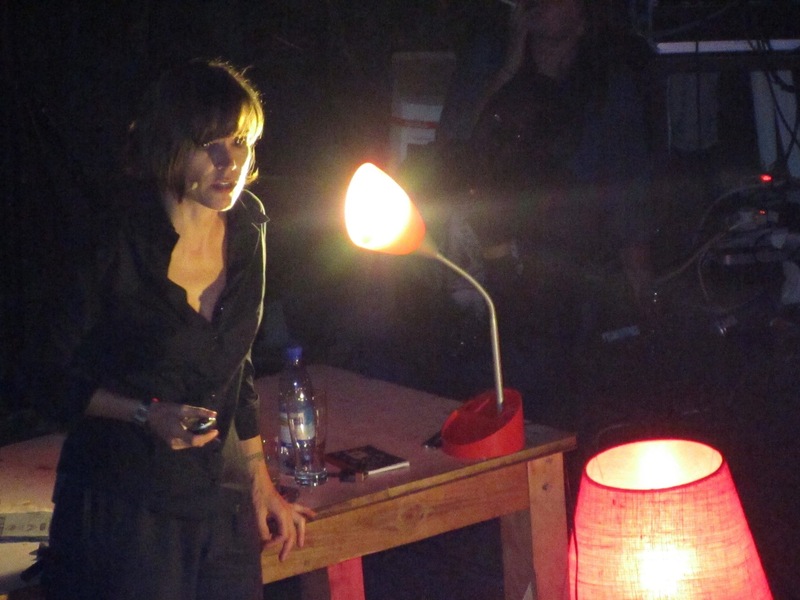 Jane Bussmann performing at MishMash, Kampala, May 2012. I agree. From when we are children in SST class, we are taught that it is through speaking—our oral tradition—that we Africans express ourselves best. We are shown illustrations of white-haired seniors sitting around bonfires and speaking earnestly to the youth whose faces are shining with interest. This might have been an accurate portrayal of how African stories travelled from generation to generation 40 years ago, but not today. In this age children as young as 13 are demanding iPhones from their parents and most of our living is done online. We need to get writing. In my opinion, to make art out of tragedy is a hard but essential thing. To make comedy out of sadness is more than essential. While Uganda’s writing culture is still tottering, testing its legs; its reading culture has outgrown the stereotype that was once so tightly wrapped around it. Uganda is quickly filling with voracious readers, some of whom belong to a book club on Facebook called A Place Where I Can Discuss Books With People Who Hopefully Get It. After interviewing Jane for the New Vision, I posted a note about her on this page a few days before her show. As many of the group members are writers themselves, it was interesting to read what they had to say about Worst Date Ever and the Bussmann-show. The first person to comment was disgusted with her style, saying that she couldn’t stand the way Bussmann had made jokes about the peoples’ pain, and that somebody needed to point her in the direction of Binyavanga Wainaina’s famous Granta article titled How To Write About Africa. Considering that Bussmann had never been to Uganda or any African country before lust and curiosity led her to Uganda, is it fair to judge her book with the same standards as we would have if a native was writing about the same subject? Just how wide a pavement for error, or touristyness should we give foreigners who write about our homes? Would I be expected to present let’s say Spain and its issues with the authority, clarity and authenticity of a native? Would my story be considered a fake if I wrote from the perspective of a visitor, telling the world about how I related with the place, its people, its food and its hot peacemakers? I surely hope not. I’m impressed by Jane’s ability to balance the humor, and I am looking forward to people from Uganda sharing their stories to the world by writing more. Mildred Apenyo is a reader, a writer and a copywriter. Some of her work can be found in the African Woman Magazine, Sunday Vision, ULK and on apenyo.wordpress.com. She also reads a lot. All photos from the MishMash-event by Adam Williams. To Mildred; your voice is extraordinary. Wow…this piece blow me away…. To Uganda. It is time to pick up your pens and write furiously! Thank you Mildred you are a very bright star in Africa. Uganda should love you forever!